Langkawi is a famous tourist-leisure destination in Malaysia. It's famous for its beaches and snorkling and diving activity's. Langkawi consists of 99 legendary islands. One of these islands is Pulau Rebak. It's situated in the south western part of that group, overlooking the Straits of Malacca and bordering the Andaman Sea. There's only one resort on this private island: Rebak Island Resort. The resort offers seafaring adventures and jungles discoveries for your holiday. Pulau Rebak is situated not far from the main island. The resort baths by the sun. There's always a cool breeze and there's a lush of tropical surroundings on the island. Rebak Island which measures 390 acres is accessible by boat from the the island's Langkasuka jetty point on a 10-minute ride away. Daily flights serve Langkawi from Kuala Lumpur, Singapore, Osaka and Taipei. Langkawi is also accessible by road from Kuala Lumpur at a distance of 486km and from Singapore at a distance of 830km. Tristan v.d. Waart, a visitor of this site, mailed me about this paradise resort. Tristan v.d. Waart: The Resort, where we have been, was called: Rebak Island Resort. Far and away the best resort we've ever been. It's surrounded by jungle and it has a beautiful accommodation. Quit different than we are used to. You have to go by boat to the island of Rebak, which is a private island. On the island there's also a little harbour, where ships can moor to the island. Thanks to this little harbour there's now a supermarket and a restaurant, where you can have dinner for reasonable prices - this in contradistinction to the resort restaurant which is only 100 yards away. It's a pity that pictures, we got, can't reflect the atmosphere of this beautiful resort. I'm convinced that everybody, who choose this resort for spending his holidays, won't regret it. The only disadvantage is, that this park, is on the approach path to the airport of Langkawi. Eight times a day you can hear an aircraft coming over on its way to Penang, but if you don't mind, it's a perfect resort to spend your holidays. A strenuous excursion by foot while your senses bear witness to new and exciting adventures as you scale distances that set your heart pounding. Spot some of Asia's most exotic birds here at Rebak. Look out for the Oriental Pied Hornbill, Racquet Tail Drongo, Pacific reef Egret and many more. Maximum bird watching is 3 hours whether from 7am to 10am or 5pm to 8pm, binoculars included. Take a relaxing time off to engage in one of the most soothing recreational activities. Grab a boat and go down into the nearby lakeside or beach to enjoy a fun-filled fishing trip. Visit the best waterfalls in Langkawi at the Mat Chinchang forest and discover the history behind Telaga Tujuh. This 4 hour tour is conducted for a minimum of four persons. Trek through the Gunung Raya forest and waterfalls, to the tallest peak of Langkawi at 911 meters. This 4-hour tour is conducted for a minimum of 4 persons. The best round-island tour is available at RM230 per boat charter or RM60 per person for less than 4 persons at duration of 4 hours. Enjoy a private time on a secluded island at RM35 per trip at a maximum of 2 persons per trip. Picnic basket can be arranged by room service upon request. Available daily from 9am to 3pm. Discover Rebak Island on wheels and cycle past palm trees, Malaysian greenery and seaside. Further information available at the lobby. Explore Malaysian hills, slopes and mountainous terrain on a 4-speed mountain bikes that'll take you back to the days of carefree adventure and fun. Outdoor racquet smashing workouts are easily achieved at RM10 each hour inclusive of 2 racquets and 2 cans of tennis balls, from 8am to 8pm daily. Further conditions apply to damage and loss. The Harbour Store Shopping Arcade offers a shopping spree for those eagerly seeking mementos from their visit. This luxurious property near Langkawi is located in a secluded spot on 389 acres of land on the privately-owned Rebak Island. Langkawi is about 5 kilometers away. The resort is well equipped and the timber villas are set in clusters across the beautiful gardens. The resort offers airport transfers, full business facilities, and a meeting room that can accommodate up to 100 persons. 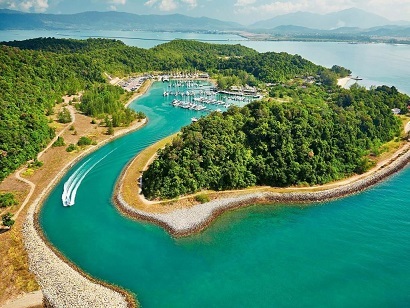 Also featured is the only fully-equipped marina in Malaysia, complemented by a range of yacht services and facilities. Other on-site services and facilities include Internet access, laundry, car rentals, a library, and a lounge. For dining, there are a number of restaurants as well as the option of 24-hour, in-room dining. All in all, Vivanta by Taj - Rebak Island Resort is a brilliant place of stay.